My preferred Starting 11, as well as attacking plan. Song and Djourou may replace Denilson. They are physically stronger, adding steel to the midfield. Denilson has better technical skills than them. Fabregas focuses on making runs forward into the box. Walcott attacks down the wing as he has pace. Arshavin and Van Persie are skillful players going forward. Lets take a look at the defensive strategies. Arsenal attackers are technically skilled in PES 2010, and Walcott is blessed with pace. With a light blue arrow, they will drop slightly deep to collect the ball and attack the defence. 1. Counter Attack – With 3 talented strikers, including a fast Walcott, Arsenal can counter attack effectively through the Right Wing. 2. CB Overlap – Gallas is great at going forward. Using him as the overlapping CB is a great way to pressure opponents’ defence in the dying moments. Or perhaps Vermaelen can recreate his real life scoring form? The players with high potential are Bendtner, Ramsey, Traore, Vela and Wilshere. Bendtner, 191 cm. He will become a brilliant target man for Arsenal in PES 2010. Traore, 185cm, will make a great SB/ SMF. Wilshere, 170, and Ramsey, 178, may grow to be talented midfielders. But they are too weak to match their stronger defensive midfielders opponent. Tends to lose out on headers and tackles. Vela, at 172, is a small player. However, I would use him as a SS, which is an ideal position for him to sprint and dribble past defenders. In addition, I would put him more to the right side, allowing him to cut into the box and shoot with his left leg. Arsenal are good when they attack from the wings. Fabregas pose a major threat from midfield too. Arsenal does not have a target man, unless they use Bendtner. With a pair of tall, strong CBs, their crosses will not hurt you. Arsenal has poor defensive midfielders. Denilson is too lightweight and can easily be outmuscled. 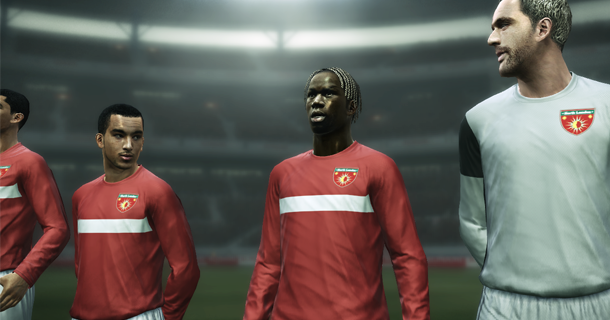 Djourou and Song Bilong, though strong, have poor ball control. Counter attack Arsenal on their flanks, as Clichy and Sagna often make attacking runs, leaving gaps at the back. And this concludes my PES 2010 Arsenal team guide. Need some tips on your team? Leave a comment here or in the chat box!